Synopsis: Within the European Union, social security basically remains a national field of competence. The lack of common norms has paved the way for a large disparity in social protection between EU Member States, which is not conducive to the European single market. Moreover, it may lead to an increase in poverty and social exclusion in some regions and intensify economic competition between Member States on the basis of labour costs. At the same time, almost all EU Member States are bound by one or more international social security instruments developed by the International Labour Organization (ILO) and by the Council of Europe. The most important instrument, ILO Convention No. 102 on Minimum Standards of Social Security, was adopted in 1952 with a view to promoting the right to social security for everyone, to guide nations in the development of their social security systems, to create higher standards, and to prevent an imbalance in markets caused by unequal social costs. From the perspective of two case studies, this book seeks to address the question whether the standards are still suitable to meet their objectives sixty years after their creation. For example, can they still be used as a benchmark for the development of social security systems? Do they contribute to better social protection? And do they provide a common basis for social security within the EU context? The study starts with an in-depth analysis of the international standards, followed by the case studies of the Czech Republic and Estonia. The country studies provide a description of the national social security systems and a comparison of these systems with international standards. 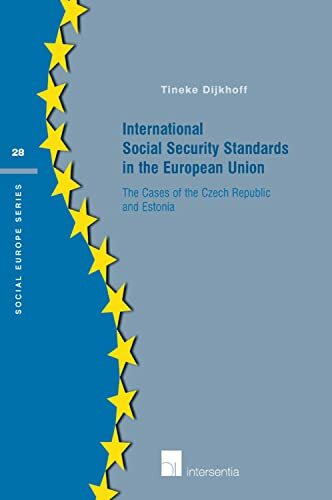 The last part of the book comprises conclusions and discussions regarding the applicability and adequacy of the international standards in the two countries, which are, however, also relevant to other EU Member States. About the Author&colon; Tineke Dijkhoff holds a Legal master's degree at Tilburg University with a specialisation in Social Law. She obtained a PhD degree at Tilburg University (2011). From 1987 till 2002 she held different positions at mental health care organisation. Since 2002 she was a jurist at a law firm in Breda. Since 2006 she as lecturer at Tilburg University Law School at the Department of Social Law and Social Policy and PHD fellow at the same University. At the moment she is Senior Researcher at the Max Planck Institute for Social Law and Social Policy.